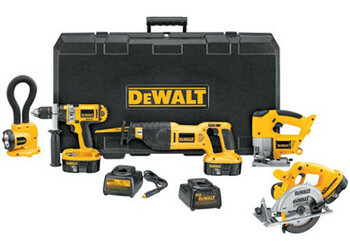 Dewalt Heavy-Duty XRP™ 18V Cordless Hammerdrill/Drill/Driver/Circular Saw/Reciprocating Saw/Jig Saw/Flexible Floodlight/Vehicle Charger Combo Kit. DC390 18V circular saw with 6 1/2" 16 tooth carbide tipped blade and rip fence can cut 2x4s at a 45 degree angle in a single pass. DC385 18V cordless reciprocating saw with keyless blade clamp allows quick blade change without touching blade or reciprocating shaft.